Please be advised that access to Artlish Caves Provincial Park is very difficult as a result of road deactivation activities outside of park boundaries. Approaching from the west, by way of Atluck Lake, a bridge has been removed on East Artlish Main approximately 50m from the Artlish Main logging Road and visitors must now walk several kilometres on overgrown former logging roads to the park boundary and caves beyond. Trails receive limited maintenance and are difficult to access; please exercise caution. Deactivated logging roads into the park, approached from the east from the Zebellos Mainline, are also overgrown and difficult to follow. Artlish Caves Provincial Park is known for its spectacular and unique karst features (a distinctive topography in which the landscape is largely shaped by the dissolving action of water on carbonate bedrock, usually limestone, dolomite or marble), which are of provincial and national significance. The remote park features two large cave entrances and an underground river within an old growth forest environment. This area was proposed for protection by the local community for many years before becoming established as a park in 1996. Although there may be potential for caving opportunities in the future, this area is sensitive and use is not recommended until a management plan is complete. Access to this park is by active logging roads. The chance of encountering loaded logging trucks while traveling these roads is highly likely. Logging trucks have the right of way; vehicles must yield to logging trucks and use pull-outs when possible. Visitors should be very careful when hiking through the forest as there are no developed trails. There are a number of hazards associated with karst topography, including sink-holes and grikes – places where people could, at the very least, twist their ankles. Visitors must also walk about 1 km of deactivated logging road prior to reaching the western boundary of the park. To access this 1 km of road, they must first cross a creek. Visitors should be aware that water levels in this creek can rise fairly quickly during periods of wet weather. Bring your own water, as potable water is not available in this park. Any surface water you may find must be boiled, filtered or treated prior to consumption. Artlish Caves is located northwest of Zeballos on northern Vancouver Island. Just accessing this park can be a serious undertaking. The most popular access is at the west side of the park through Canadian Forest Products TFL 37. This system of roads is accessed via the Zeballos Forest Service road (off Highway 19 just north of Woss). Drivers should be very cautious as the chance of encountering loaded logging trucks while traveling these roads is highly likely. Cultural Heritage: Artlish Caves lies within the traditional territory of the Kyuquot/Checleset First Nation peoples. Culturally modified trees (CMTs) can be seen in the park. 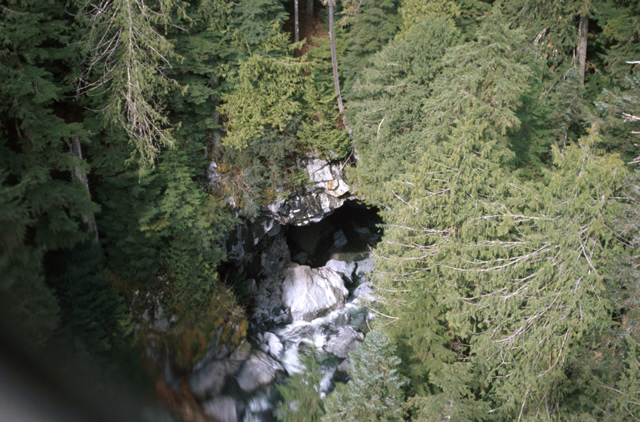 Conservation: The park provides protection for Vancouver Island’s last remaining undisturbed karst unit that incorporates a major river cave. The Artlish River flows completely within the Artlish River Cave for a portion of its length. The park also protects an old growth valley bottom karst ecosystem with coastal western hemlock and western red cedar as well as some amabilis fir and Sitka spruce. Wildlife: The area provides winter habitat and a migration corridor for Roosevelt elk, as well as habitat for sockeye, Coho, Chinook, and pink salmon, steelhead and rainbow trout. Approved Management Direction Statement [PDF 582.28KB] for Artlish Caves Provincial Park is available online in pdf format. Opportunities for recreational caving exist in this remote park, although the routes to the cave entrances are not marked. Use caution in this area. These caves offer a wilderness caving experience and are suitable for experienced, adventurous cavers only. Note: Although there may be potential for additional caving opportunities in the future, this area is sensitive and use is not recommended until a management plan is complete. White-nose Syndrome is a fungal disease that has been linked to mass die-off of hibernating bats in North America – it poses a significant threat to colonies in British Columbia. Please read the White Nose Syndrome fact sheet [PDF 552.76KB] to understand the disease, how to limit it’s spread, and find out what cavers and park visitors can do to help. There are no developed trails at this park, however there are some rugged, non-maintained routes through the forest. Black bears are common in the park, as are bald eagles, black-tailed deer and Roosevelt elk. The hike into the park also offers stunning views of old-growth Sitka spruce forest.